The Lady Clarets continued their winning momentum in the North West Women’s Regional League, with a 7-1 victory against MSB Woolton lifting them to fourth. With many games still to play including games in hand, an exciting final two month of the season lies ahead and the Clarets sights are firmly fixed on a high finish. The Merseyside team have competed well against the Lady Clarets in the past, and the early stages of the game indicated that a tough contest could be in store. Both teams pushed forward in turn, but the Clarets centre half duo of Jo Holt and Sammy Fleck kept the visitors a safe distance from the goal. Lynette Craig opened the scoring when player of the match Evie Priestley chested down a cross at the far post to Craig, who shot home from six yards. Craig turned provider for the second goal when she passed across the midfield to Sarah Greenhalgh, who sprinted in towards goal. As she closed in on the keeper she changed direction to deceive her and then slotted into the net. Greenhalgh was on hand to add another to the tally when Justine Wallace collected in midfield and ran out wide before delivering a cross to the far post. Greenhalgh had evaded the defence and calmly headed in. 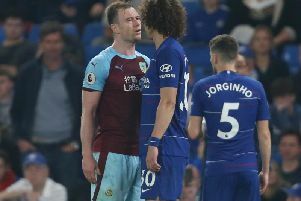 The visitors were frustrated as their attempts to reduce the deficit broke down as they often fell into the off-side trap or over hit balls that were confidently cleared by the Clarets goalkeeper Taylor Gregson. Visiting striker Carmen Troiano, once a Lady Claret and also part of last season’s promotion winning Bolton team, worked tirelessly but was contained well by the Clarets’ defence. In the second period, the visitors’ determination to turn the game around continued with some tough tackling. Priestley finally found a way through when Wallace intercepted a clearance and, as the ball fell to her, she quickly evaded a defender and shot hard from 18 yards, beating the keeper at the near post. Georgia Payton was unlucky not to join the scorers’ list with a sublime effort when she controlled a long throw on her chest and then turned to strike a volley which crashed against the crossbar before being cleared. The Clarets continued to press for further goals, and were rewarded when a corner skimmed Priestley’s head and was tipped over to the far post, where Fleck ran in to score a well-deserved goal. The visitors were determined to make a mark on the game and they were awarded a free kick out wide. It was floated into a crowded goal area, forcing Gregson to fist the ball clear, and were later awarded a penalty when Gregson clipped their striker on a one on one break through. The penalty was despatched to bring the score to 5-1. In the final minutes, Craig received a smart lob over from Payton to score her second and Priestley picked up a loose ball in the penalty area to score her second. On Sunday, the Lady Clarets travel to Fleetwood Town Wrens in the quarter finals of the League Cup, while the reserves play Penwortham Ladies at Nelson and Colne College, both at 2 p.m.